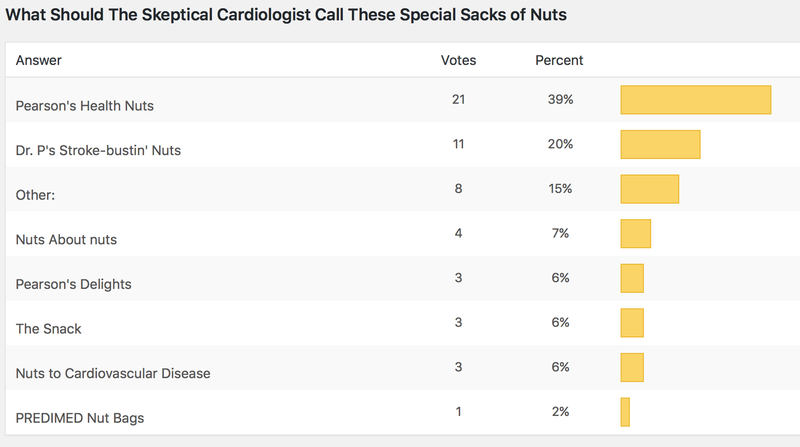 The results of my request for reader input on naming the mixed nuts based on the PREDIMED study I plan to give out to my patients are hot off the presses. Second place went to my personal favorite “Dr. P’s Stroke-bustin’ Nuts. Consequently, I’m soliciting your input into a revised poll that incorporates some of the newer suggestions. There is much excitement here at mixed nut central because the non-fumigated raw almonds have arrived! Previous PostThey Were in Normal Sinus Rhythm for HalloweenNext PostCigarette Smoking Kills: Should Missourians Vote Yes To Raise Cigarette Taxes? Walnuts, are perhaps the overall best. Almonds for those of us who have custom made teeth are difficult to crack even with the hulls removed. Plus as they age they become harder. And pemmican , but demand for this is minor. Walnuts supply nearly equal value. A glucose testing device is s must. After careful consideration, I choose walnuts purchase at Walmart where I converse with many of my Afib friends, who ate snickers or payday bars with lowly peanuts. I just received mine yesterday!